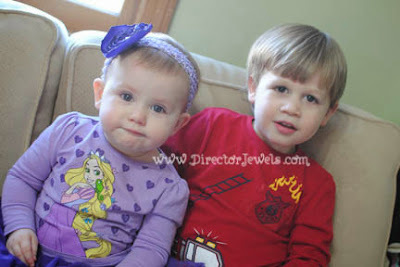 Director Jewels: Toddler Time Tuesday: Meet Lincoln and Adelaide! Well, I had good intentions. When you start a new blog series, it's not ideal to wait until the last two hours of the day to get the post up. Hopefully anyone who wants to link up will forgive me! 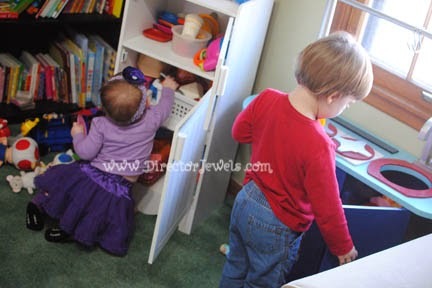 I'm leaving the linky open through Saturday so you have plenty of time to join the fun! 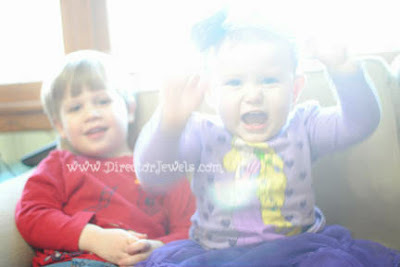 Without further ado, welcome to the very first Toddler Time Tuesdays Blog Hop at Director Jewels! My goal is to meet other mamas who are in the same boat as myself - raising little ones who are not quite babies, but not quite "big kids" yet either - and create a way for us to share the quirks, trials, and joys of our little ones. If you have toddlers, please stop by each week and link up! 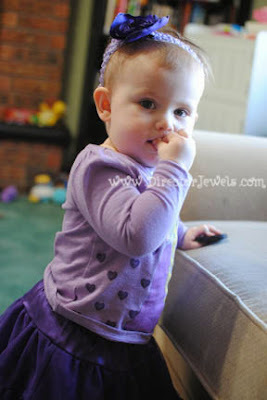 Today's topic is easy - since it's our first week, we're Introducing Our Toddlers! I have two of the sweetest and most rambunctious children on the planet. Meet Lincoln and Adelaide! These two are a barrel of fun. They are mostly best friends, though sometimes he almost kills her with love. She chases him around the house and giggles gleefully when he jumps over her or runs circles around her while she sits on the floor. Lincoln will be three in February. I'm not sure if that means he will be a preschooler, but I'm not really accepting that term yet - so we're sticking with toddler. He loves cars, trucks, graham crackers, spaghetti, RUNNING, Scooby Doo, Super Mario Bros., reading books, and any sort of emergency vehicle - especially firetrucks. He gives big hugs that make my heart feel so full. He says "Mommy hold me up!" when he wants me to lift him. He says "OH yes" to almost anything - he's such a happy little guy. 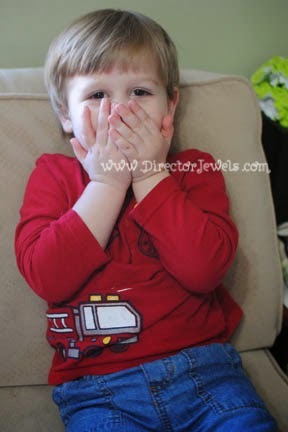 And the hands-on-his-mouth excited expression? MY FAVORITE. Adelaide turned one in November. She is a sassy little miss with a mind of her own. She's been walking since ten months, so she's pretty sturdy on those chubby legs. She loves dogs ("woofs"), owls ("who-who"s), climbing on our fireplace, anything Lincoln has in his hands, princesses, and baby dolls. She rarely sleeps unless I am holding her. She "gives loves" by resting her head on your shoulder, tucking her arms beneath her and squeezing herself into you. She nods or shakes her head when asked a question and knows what she wants all the time. She would read books for hours and really is content as long as she's allowed to be involved in our daily chaos. It's crazy, beautiful madness around here and even though sometimes I feel like I might lose my mind, I love it! What a blessed mama I am, to share my life and my world with these tiny little people. What most of my photos actually look like. Now it's your turn! Introduce me to your babies and link up below! Don't forget to grab the Toddler Time Tuesdays button for your post.